Walls at the back of the Morrisons supermarket in Burnham-On-Sea, Somerset; 20 Mar 2013. I have been and probably still am married to my 70-300 telezoom – the thing is, I so often “see” at 300mm, which is x6 in 35mm format. But I’ve taken this lens to Burnham so many times that, today, I thought it time for something different – a wideangle zoom. And the change worked – new perspectives appeared everywhere. 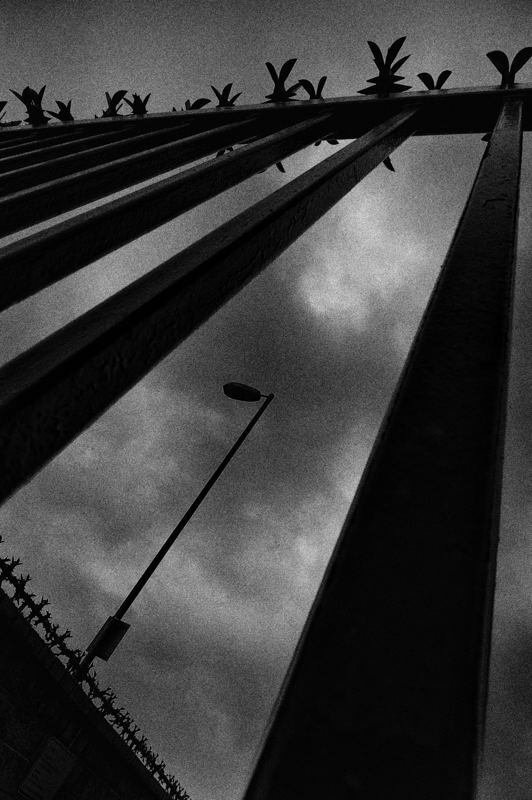 This post’s title is a bit naughty as we like Burnham a lot – its cheap and cheeful but uncomplicated, and there are good eateries and food shops – and here I am portraying it like some kind of prison camp! Its a great place! D700 with 16-35 Nikkor at 21mm; 400 ISO; converted to mono with Silver Efex Pro 2, starting from the Low Key 2 preset. Hard to believe, but FATman Photos has stumbled through half a decade. I certainly can’t believe it – but then again I must also say that blogging seems now to have been always there, I can’t remember a time when I wasn’t doing it. As always, I’m very grateful to those who take the time to look at my photos – and especially so to those who take the time to comment upon them – THANK YOU ALL! Your interest and support are very encouraging, and I have not the slightest doubt that your encouragement has pushed me forwards and improved my photography. A few simple stats. Since 26 April 2011, this blog has put out 1,818 posts, and there have been 18,342 comments >>> but since I (virtually always) make it a rule to reply to comments, around half of these are my grateful responses. And the image? 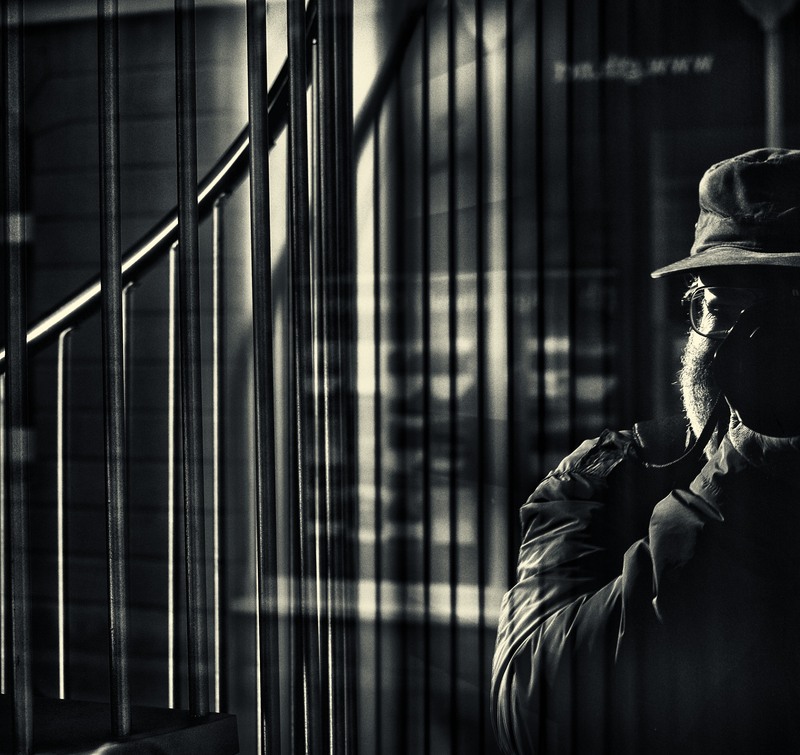 Well its me photographing me, standing beside a metal spiral staircase, reflected in a shop window. I looked in the window and thought “Who’s that nice old man?”, which just goes to show how first impressions can be misleading … 😉 ….. Thank you again for looking at my blog. This image is best viewed enlarged: click onto it to see a larger version in a separate window. The mud banks and last lazy meander of the River Brue, south of Burnham-On-Sea; 12 Oct 2015. The muddy and very sluggish waters of the Brue occupy the centre of the frame, curling round to top left before abruptly veering right between scalloped banks to flow out into the much larger estuary of the River Parrett. So, the coast of the Somerset Levels – the second largest wetland in the UK after the East Anglian Fens – flat, lush and with lots and lots of mud. But here we are almost at the Levels’ southern edge, and hills of harder and much older rocks can just be seen off to the south; their slopes start to rise from not far behind that distant misty shore. The first version of this view, in black and white, can be found here. D700 with 24-120 Nikkor at 120mm; 200 ISO; Color Efex Pro 4. Crossing the main street in Burnham-On-Sea; 12 Oct 2015. 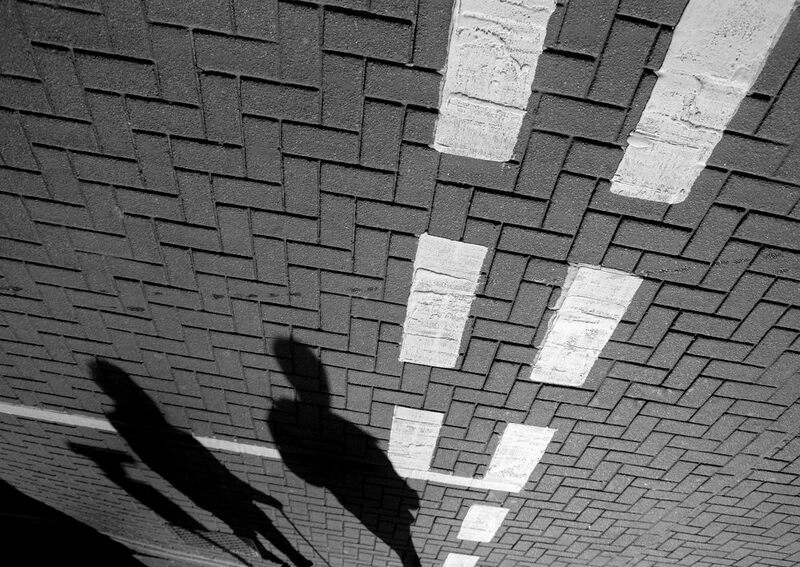 Shadows on a sunny day, road markings on a junction – and a wide angle lens on the camera. D700 with 24-120 Nikkor at 24mm; 400 ISO; Silver Efex Pro 2, starting at the Neutral preset; rotated by 180 degrees. The view south over the mud banks and last lazy meander of the River Brue before it empties into the much larger estuary of the River Parrett, which is at top right; 12 Oct 2015. 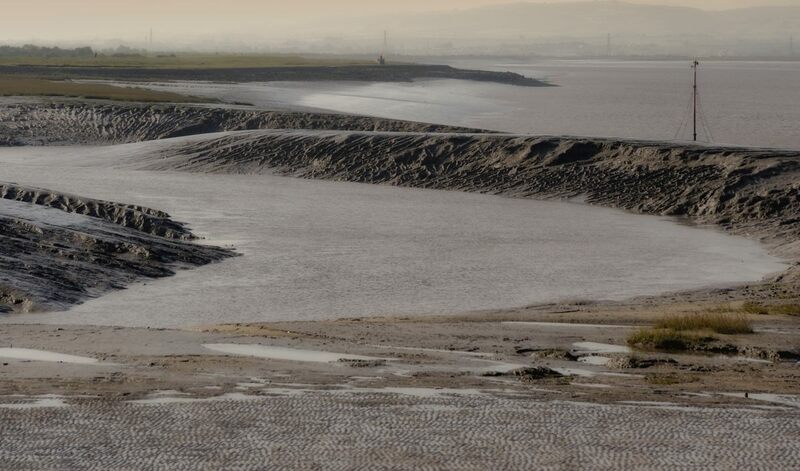 The muddy coast of the Levels, immediately south of Burnham-On-Sea – and anyone foolhardy enough to try wading across this narrow stretch of water and mud to the Brue’s other bank would most probably have to be rescued by professionals in the trade. The rocks in the foreground are totally foreign. This is a coast of mud and some sand too, with builders’ rubble at the top of the beach here to help bolster the sea defences. The far off line of pylons are coming from the two Hinkley Point atomic power stations, which are just out of shot at top right. Amidst considerable controversy, a third station is being built there. My feelings on that? Well, simply that however it is produced, the UK does need to start getting more power from somewhere. Click onto the image to see a larger version in a separate window. D700 with 24-120 Nikkor at 70mm; 200 ISO; Silver Efex Pro 2, starting at the High Structure Harsh preset. The seawall at Burnham-On-Sea, looking northwards along the promenade; 12 Oct 2015. The Somerset Levels run down westwards into the muddy waters of the Bristol Channel, and last Monday we were on this often bleak coast at cheap and cheerful Burnham-On-Sea. It was a beautiful autumn day, with bright, wall to wall sunshine, and the tide was actually almost in, so that its waters hid many of the vast expanses of dark, glutinous mud for which this stretch of coastline is justly infamous. We walked south to where the sluggish River Brue empties into the much larger River Parrett, and then turned our backs on the sun to walk back northwards into a distinctly chilly northerly breeze. 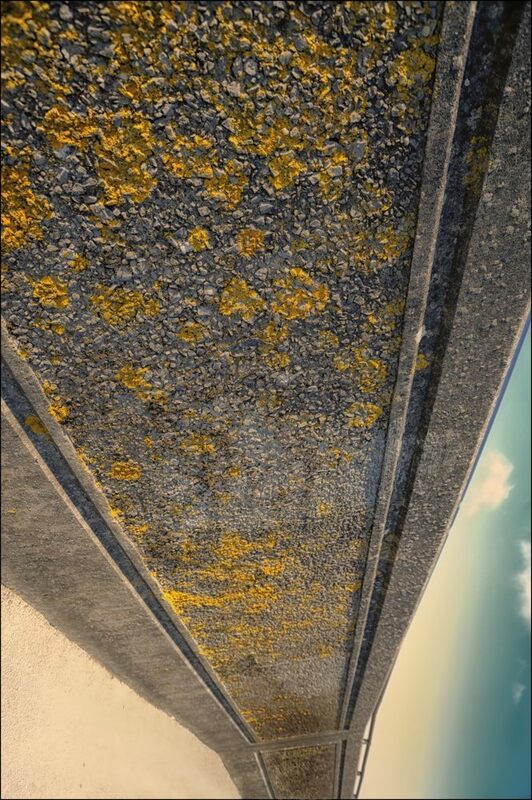 And there, beside us and always with us, was the inland side of Burnham’s tall and solid seawall, speckled with bright yellow lichens and converging off into the distance as if there was no tomorrow. That converging mass of masonry hit me in the eye, so I dropped down onto one knee, endured several well-meaning passers by asking if I needed any help getting back up again, and took that convergence in with a 24mm lens. The sky was blue, and the flat promenade was being seared by blazing sunlight that grazed across the vertical wall. Back at my computer, the resulting image yelled at me to be turned into portrait format. D700 with 24-120 Nikkor at 24mm; 200 ISO; Color Efex Pro 4; rotated 90 degrees clockwise. 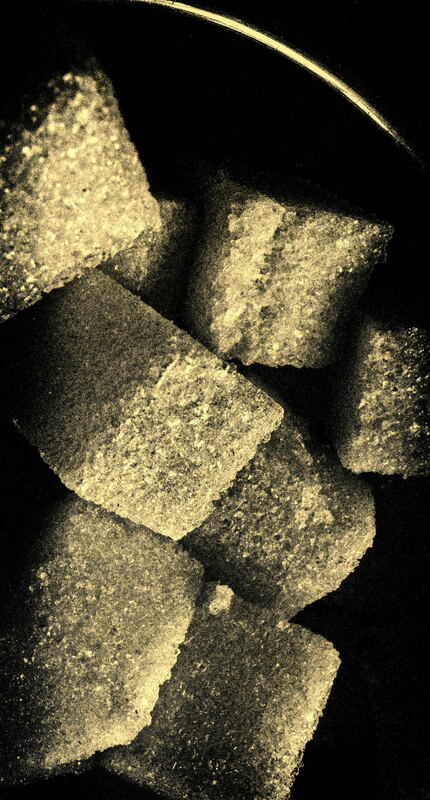 Sugar cubes on our table in Baillies Cafe, Burnham-On-Sea, Somerset; 7 Mar 2012. Taken during the interval between making our order and the arrival of the delicious fodder. The Full English Breakfast included Bubble And Squeak which, for those not already familiar with it, is a wonderful, fried concoction of potato, cabbage, onions and other veg left over from earlier meals, named after the noise it makes while being cooked in the frying pan – glorious stuff! This is white sugar, but I’ve darkened it down and toned it, and I think that the reflective edge of the metal sugar bowl, top right, adds something to the shot. Canon G11 Powershot; 400 ISO; converted to mono in Silver Efex Pro 2, and further manipulated in SEP2 and Capture NX2. The reflection of one window in another, Burnham-On-Sea; 5 Nov 2014. 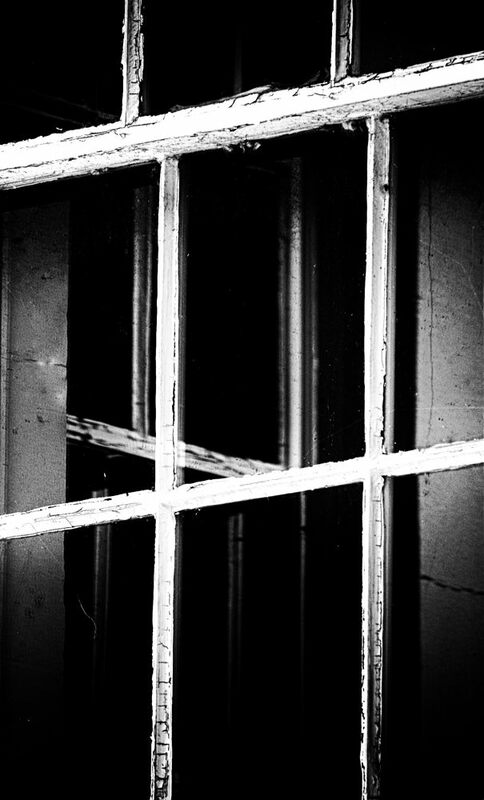 The real window is brighter in tone than the other window’s reflection. In this case there are two objects, by which I mean two windows. But if I were to look at a single object and its reflection, and if I wished to retain a natural effect – as opposed to creating something equally valid but unreal – the actual object is always brighter, if only marginally so, than its reflection. D700 with 70-300 Nikkor at 300mm; 200 ISO; Silver Efex Pro 2, starting at the Film Noir 2 preset. 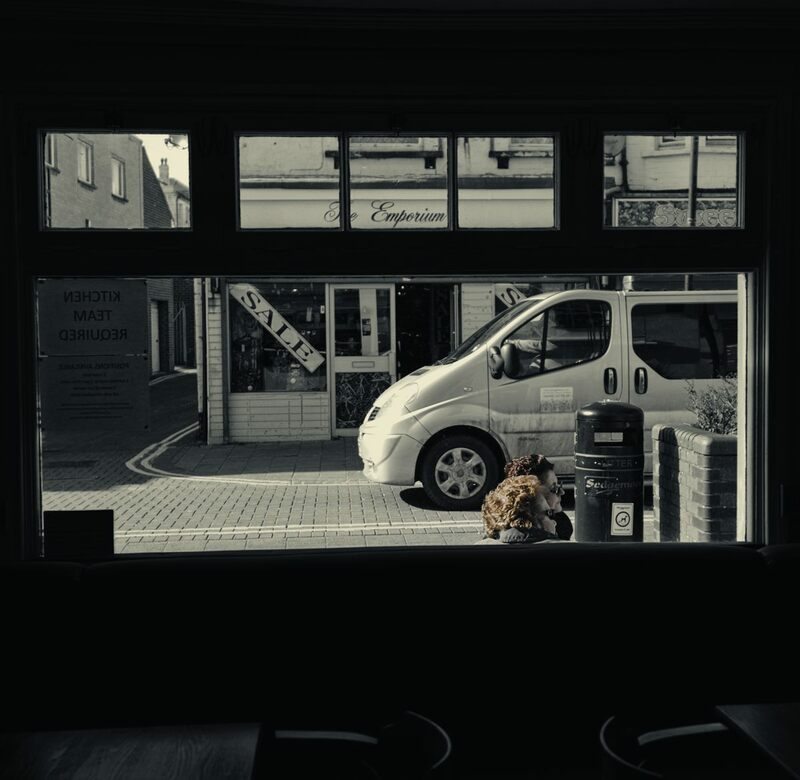 Two women, sitting in the sun, outside the Somerset & Dorset Inn, on Burnham-On-Sea’s main street; 6 Mar 2015. We’d had a good pub lunch in Burnham, and were getting up to leave. My camera had been in my bag during the meal but I took it out in case there were any more images to be found along Burnham’s main drag. And I looked up and saw this. Lighting up is not allowed in England’s public houses, and so these two smokers, in thick coats to ward off the decided chill of that breezy, early March day, were enjoying their cigarettes sitting on a bench outside in the street. The picture is in three parts, which give it considerable depth. First, inside the window, the pub’s tables and chairs gently catch the light. Then, behind the furniture and not lit by the window’s light, the inside wall of the pub is dark. Lastly, four windows give views of the town’s High Street – can I call this a quadriptych??? Anything to give this blog a little class. The three smaller windows show relatively restrained amounts of detail, but the larger window discloses more things than you can shake a stick at – including the main street, a side street, and some interior detail in The Emporium, the shop across the road. Other little gems of English life I can regale non-Brits with? Well the white lines that are disappearing off down the side street are in fact bright yellow, as a warning that parking is forbidden there at all times. And if you look very carefully at the enlarged version of this image, you can just see that the litter bin beside the ladies bears a tasteful little notice warning dogs that they should have their bowel movements elsewhere – ah, Merrie England! So, in view of all this other data, I’ve restored the colours of the women’s dyed locks because these two are the subject here – we are looking at them, covertly I must admit, sitting amidst many facets of the local world. D700 with 16-35 Nikkor at 35mm; 400 ISO; Silver Efex Pro 2, starting at the Low Key 2 preset and selectively restoring colour. The southern end of the seawall at Burnham-On-Sea; 6 Mar 2015. Burnham-On-Sea is on the coast of Somerset, where the Somerset Levels run down – exceedingly gently! – into the sea. 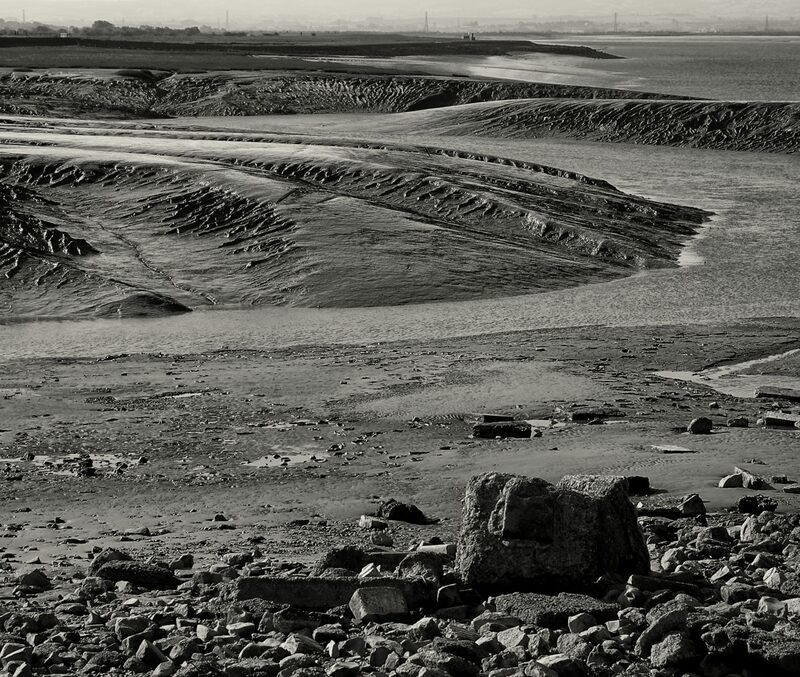 I emphasise gently because the land here is very flat, the rivers are very slow and muddy – and were it not for sea defences like this, the incoming tides would roll on into the interior of Somerset, as indeed they used to in the not too distant past. Springlike weather being forecast, we drove down to Burnham on Friday, for a bracing walk along the seaside promenade, a good pub lunch and a (very) little shopping. The walk southwards down to the end of the town’s promenade reveals the little estuary of the River Brue, which flows down to the sea here from the heart of the Levels. Reaching the end of the prom and leaving my wife sheltering behind a wall from the still decidedly cool southerly, I walked down to the rough beach and was faced with this view. On the right is the impressive seawall, which is curved to throw a lot of the waves’ energy back out to sea, and which is about 10 ft. high – tho it seems rather higher than that when you’re standing there below it. To the left of the wall’s base is a concrete walkway on which I’m standing, and left of that again the beach can just be seen (and which is more obvious in the larger view of the image). As soon as I saw this scene and thought of the wide angle zoom I’d brought for the day’s photography, black and white was an obvious choice. 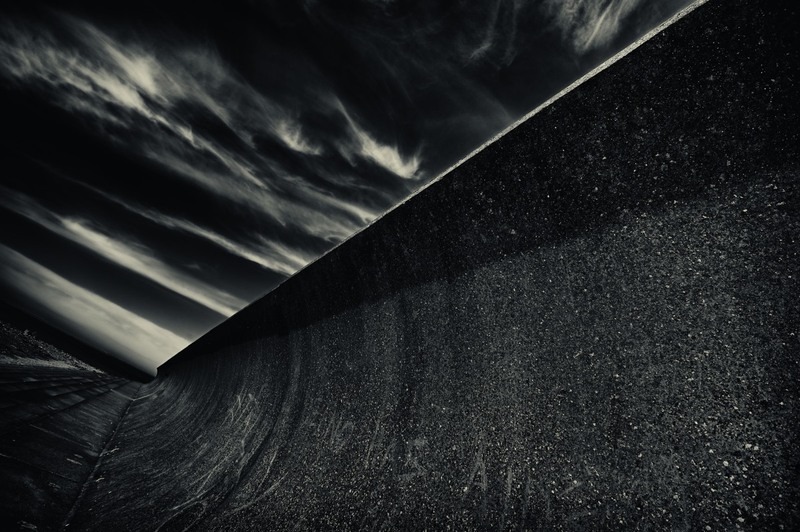 And to make things more dynamic I tilted the camera to the right, so that the horizon, which was parallel to the cloud bases over on the left, tilted upwards – while the towering seawall was toppling back over towards the right. Then, back home, on this computer, I carried out my usual initial processing in Capture NX2 (Levels & Curves, sharpening; but no cropping in this instance), and also significantly darkened the pale blue sky, so that it would assume a darker tone when converted into black and white. This changing of an image’s colours prior to converting the image to mono is something I sometimes find useful – I recommend this technique to you! I thought about cropping the shot to make the prominent pale edge to the top of the wall exit the frame through the upper right corner, but decided to stick with the full frame version. And then, as always, conversion into black and white, and further processing, in the magical and fairy tale realms of Silver Efex Pro 2. D700 with 16-35 Nikkor at 16mm; 200 ISO; camera tilted; Capture NX2; Silver Efex Pro 2, starting at the Full Dynamic Harsh preset.